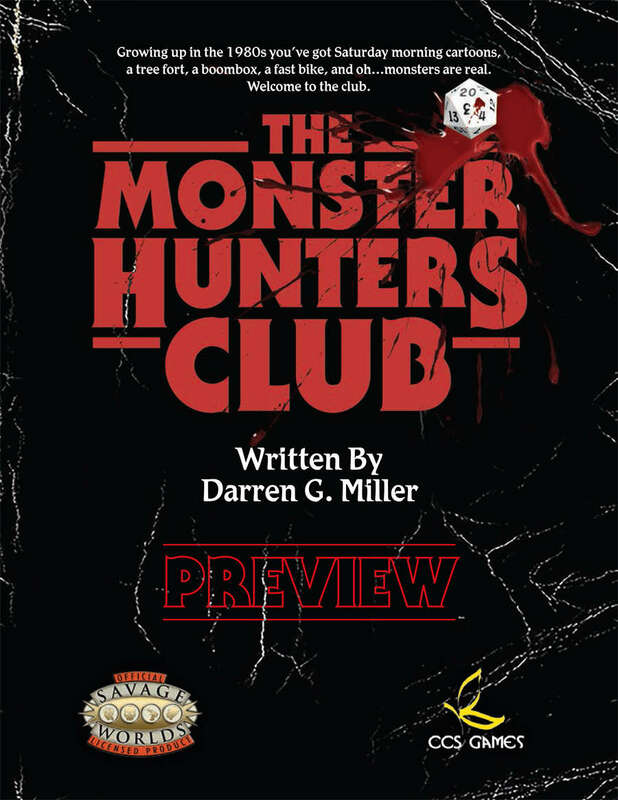 [19:38] <+DGMiller> Hello, my name is Darren G. Miller, writer of The Monster Hunters’ Club, a setting for the Savage Worlds RPG. [19:39] <+TommyBrownell> I’m Tommy Brownell. Darren kindly retained my services as editor for said book. [19:40] <+FabledEnvironments> And I am actually the publisher for the book. I have been working with Darren and Tommy on the project as well as Karl Keesler, who couldn’t join us tonight. [19:41] <~Dan> Thanks, guys! The floor is open to questions! [19:42] <+TommyBrownell> Darren, wanna give the “elevator pitch”? [19:44] <+DGMiller> Something strange is happening in the town of Gulf Haven. Horrible creatures are coming to life. The adults seem blind to the entire thing. It’s up to you to find out what is happening, and stop it before it’s too late! [19:44] <+DGMiller> Growing up in the 1980’s… You’ve got Saturday morning cartoons, a tree fort, a boombox, a fast bike, and oh… Monsters are real. You heard me. [19:45] <+DGMiller> Don’t bother telling your parents. Grown-ups can’t see ‘em. When something gets smashed up, they blame us. When somebody goes missing, they blame someone from out of town, or maybe the Russians. The monsters are real though, and it’s up to us to do something about it. [19:45] <+DGMiller> You can’t phone home, and there’s nobody you can call. It’s up to you to save the town, and maybe even the world! [19:46] <+DGMiller> So, the basic pitch is: You’re kids growing up in the 1980’s who discover that monsters are real, and you’re the only ones who can see them. [19:47] <+DGMiller> an adventure generator, setting rules, etc. [19:48] <~Dan> Nope, that’s your bit, sorry. [19:49] <+DGMiller> It really draws inspiration from those wonderful kids adventure and horror movies of the 1980’s and beyond, like Monster Squad, E.T. The Goonies, Super 8, It, and Stranger Things. [19:49] <+DGMiller> Now, I think I’m actually done. [19:50] <~Dan> You mentioned a couple of movies there without actual monsters, or at least without hostile ones. How do such movies relate? [19:51] <+DGMiller> Even the movies where the monsters aren’t actual, there are metaphorical monsters. [19:51] <+TommyBrownell> Also, adults are generally useless and the kids are bonding together on an epic adventure. [19:52] <+DGMiller> Take the Goonies for example. The kids have their adventures. The Fratellis not only serve as the “monsters” but the spectre of One-Eyed Willie hangs over the entire thing. [19:52] <+DGMiller> And Tommy is right. The kids, bonding, going through their trials, they are the real “sticky” element. [19:53] <+DGMiller> Also, there originally was a monster in The Goonies. It got cut for various reasons. [19:53] <~Dan> Really? What was it going to be? [19:53] <+DGMiller> It was a giant octopus in the cave with the pirate ship after the kids are forced into the water by the Fratellis. [19:54] <+DGMiller> Some of the footage survived. [19:54] <~Dan> Huh. I’ll be darned. [19:55] <+DGMiller> You can’t really talk about the monster of The Quest without giving huge spoilers for that film. [19:55] <~Dan> That’s a Nessie creature, isn’t it? The name sounds familiar. [19:56] <+DGMiller> Difficult to find. [19:56] <+TommyBrownell> That would be the movie, Dan. [19:56] <~Dan> Never watched it, but I know of it. [19:57] <+TommyBrownell> You can find it on YouTube. If that’s your genre, I recommend it. [19:57] <~Dan> Hmm. I’ll have to check that out. [19:57] <+TommyBrownell> But yeah, when Darren pitched this to me this summer, I was all in right off the bat. Savage Worlds has covered a lot of ground, but not this ground. Not yet. [19:58] <+DGMiller> I’ve gotten great response to the project, from Tommy, from Charles and Fabled Environments, from Karl Keesler who we’ve brought onboard as graphic designer. [19:59] <+TommyBrownell> Who did crazy good layout work on the free preview. [19:59] <+DGMiller> Karl, by the way, has done a fantastic job with the design and layout of our preview document, which is available on DriveThruRPG. [19:59] <+DGMiller> Tommy, you beat me to it. [20:00] <~Dan> Is there a single source for the monsters and/or all the weirdness? [20:00] <+TommyBrownell> (Link: http://www.rpgnow.com/product/222502/The-Monster-Hunters-Club)http://www.rpgnow.com/product/222502/The-Monster-Hunters-Club <~~~~the link for that preview, btw. [20:01] <+DGMiller> I don’t want to spoil the plot point campaign, but there is a variety of weirdness going on in Gulf Haven, Alabama. [20:03] <+DGMiller> Also, we’ve made a conscious design choice to not make these kids helpless. They are quite capable. [20:03] <+FabledEnvironments> I especially love the archetypes that are available to players. It really will allow folks to customize their characters. [20:03] <+TommyBrownell> As suits the genre we’re emulating. [20:04] <~Dan> In what ways are they capable? [20:04] <+TommyBrownell> The archetypes are a key element that anyone who is familiar with Streets of Bedlam (also Savage Worlds) will recognize. Darren and I are both huge fans of that book. [20:05] <+DGMiller> Each archetype has its own specialties. Some of the kids can use magic. Some are fairly robust, or are good at fixing things, or investigation, etc. [20:05] <+DGMiller> Yes, Tommy is right. Jason Blair’s Streets of Bedlam was a huge inspiration on how to handle archetypes in this setting. [20:06] <+TommyBrownell> The Archetypes allow us to give more skills/Edges/etc to the kids than would normally be available due to the way Savage Worlds handles children characters. Again, Adults Are Useless, so the kids better not be. [20:06] <~Dan> What is that, for those unfamiliar? [20:06] <+DGMiller> Those 80s movies were full of archetypal characters. They were constantly smarter, faster, and more capable than the often clueless or helpless adults. [20:07] <+TommyBrownell> Streets of Bedlam is a Savage Worlds setting that is functionally Sin City with the serial numbers filed off. And it’s pretty amazing. [20:07] <+DGMiller> Streets of Bedlam is a neo-noir setting published by Fun Sized Games, written by Jason Blair. [20:07] <+DGMiller> Yes, it’s like Sin City the RPG. [20:07] <+DGMiller> Noir/neo-noir is, along with horror, my other favorite genre. [20:08] <+DGMiller> One of the other inspirations for the setting is Jason’s first rpg, Little Fears. The kids in that game also face monsters and are also quite capable of defending themselves. [20:10] <~Dan> You mentioned magic… What is magic like in this setting? [20:11] <+DGMiller> It doesn’t stray too far from the magic systems common in the Savage Worlds RPG. [20:11] <+DGMiller> Belief, Gadgetry, Psychokinesis, and Storytelling. [20:13] <+DGMiller> Each one draws inspiration from the same classic 80s films. [20:14] <~Dan> Can you address each one? [20:14] <+DGMiller> And it actually becomes battery acid because Eddie believes in it. [20:15] <+DGMiller> For Gadgetry, think Data from The Goonies. His devices weren’t really “magical” but they were beyond the scope of what was realistically possible. Also Kevin in Home Alone. [20:15] <+DGMiller> They mimic magic in their effectiveness and their defiance of normal physics. [20:17] <+DGMiller> Psychokinesis is Charlie from Firestarter and Eleven from Super 8. They have superhuman psychokinetic abilities that come at a great personal cost. [20:18] <+DGMiller> Storytelling is very bard-like. Think Gordie LaChance from Stand By Me or Bill Denbrough from It. Also, if you’ve read Boys Life by Robert McCammon, the narrator of that book as well. [20:19] <+DGMiller> They can weave a sort of pseudomagic just by words alone. Who could forget the story of Lardass Hogan from Stand By Me. [20:20] <~Dan> What sorts of monsters do they face? [20:22] <+DGMiller> Like I said, there is a wide variety of creatures. Some are drawn from the folklore of the Gulf Coast region of the United States, some are classic movie monsters, some are unspeakable horrors that shouldn’t exist, and others are undead. Some may not even be from this planet. [20:23] <~Dan> How much of a bestiary do you feature? [20:25] <+DGMiller> The bestiary will be fairly typical size for a savage setting. It should weigh in at about 12 pages of creatures and NPCs. [20:25] <+DGMiller> I can’t tell you how many entries at this time, that is still a work in progress. [20:26] <~Dan> Why Savage Worlds for this game? [20:27] <+TommyBrownell> The beauty of using a system such as Savage Worlds is that it’s relatively painless to pull from your existing library as well (such as the Horror Companion) if there’s something you REALLY want to throw at your kids that this book doesn’t cover. [20:27] <+DGMiller> I think Savage Worlds provides an excellent template for a game like this. There is enough structure to really build something like this on, but it is minimal enough that what we’re doing can really shine through. [20:27] <+DGMiller> And yes, I expect GMs to get a lot of use from the Horror Companion for this setting. [20:27] <+TommyBrownell> Also, everyone involved are huge fans of Savage Worlds. [20:28] <+DGMiller> And I also feel like we are bringing something to Savage Worlds with this setting that hasn’t existed before. [20:28] <+TommyBrownell> I’ve personally ran it more than any system aside from maaaaaaaybe AD&D2e. [20:28] <+DGMiller> The closest any Savage setting has come is maybe East Texas University. [20:29] <+DGMiller> Tommy, I’ve probably run it more than anything except 1st edition D&D. [20:29] <+DGMiller> Because I’m old like that. [20:29] <+TommyBrownell> Which is basically “Redneck Buffy in College” (and is awesome). [20:30] <+TommyBrownell> But yeah, those are the big factors: It can handle this genre, we’re huge fans and no one has done anything quite like it in Savage Worlds. [20:30] <+DGMiller> I’d love it if our kids of The Monster Hunters’ Club went off to college at ETU. [20:31] <~Dan> How serious/dark is the setting? [20:32] <+DGMiller> It will have serious moments for sure. It will also have some humor, even if dark humor, because those moments are essential to make horror work, especially when you have kids as the protagonists. [20:33] <+DGMiller> I don’t want to get too deep into kids’ real life problems, or really deal with the real world social issues of the 1980’s. There is that underlying Cold War fear. But that is about as deep into real world stuff as I want to go. [20:34] <+DGMiller> The monsters/bad guys in those 80s films really represented all that stuff without actually being that stuff. One of the biggest fears of childhood is growing up. Often, you get the theme of holding onto the innocence of childhood as long as possible. [20:34] <+DGMiller> So, that innocence of Belief will power one of the arcane backgrounds. [20:35] <~Dan> How old are the kids by default? [20:35] <+DGMiller> The kids start off about 11 years old. [20:35] <+DGMiller> That transition from elementary school to junior high, or as it was in the south even back in the 80’s: middle school. [20:37] <~Dan> How common is PC death in the game? [20:37] <+DGMiller> Tommy and I have discussed a few things that we need to have as sidebars, like how this setting should handle “death” or incapacitation for kids. Also, how the scaling between adult abilities and kid abilities equates. [20:38] <+DGMiller> I think, in the end, allowing a character to die is between the GM and the players. But you always have to be sensitive and sensible when handling choices like that in a game about kids. [20:38] <~Dan> That was going to be my next question, re: scaling. [20:38] <+DGMiller> Again, look at the films that really inspired this setting. [20:38] <+DGMiller> There aren’t many deaths. [20:39] <+DGMiller> As I said earlier, one of the conscious decisions that was made was to make the kids competent. In some ways more competent than the adults. [20:39] <+TommyBrownell> If the adults aren’t useless, the kids could just be kids. [20:40] <+DGMiller> Like Tommy said, they need to be able to be as competent, because they have to be the heroes here. Also, it’s no fun (usually) to play helpless characters. The kids need to shine. [20:41] <+DGMiller> And if you’re kids are going toe to toe with an adult beat cop, I think you may have missed the point of the setting. [20:43] <~Dan> Do you offer any help in that regard? [20:45] <+DGMiller> The other challenge is to think of the limitations of 80s tech. [20:45] <+DGMiller> Some of us will remember those limitations quite well. Others weren’t born yet. [20:46] <+DGMiller> If you get in a bind, you can’t just whip out a cell phone and instantly summon help. [20:47] <~Dan> You said adults can’t see the monsters? [20:47] <+DGMiller> For some reason, they cannot. [20:48] <~Dan> So what happens if they’re attacked by a monster? [20:48] <+DGMiller> They can see the aftermath of what the monsters do, but attribute it to “normal’ causes. Their disbelief is too strong. [20:49] <+FabledEnvironments> We did something similar with another setting of ours. In this instance, the adult mind can’t comprehend the fact that monsters exist so they write them off as something mundane. [20:49] <+DGMiller> The monsters, for the most part realize the adults can’t see them for what they really are, so they are more subversive with the adults. Why kill right away, when you can control. [20:49] <+TommyBrownell> Another common trope: Vampires in Buffy were rationalized as “thugs on PCP”, and the town of Derry rationalizes what Pennywise does, etc. [20:50] <~Dan> So if an adult is attacked by the Wolf Man, he’d see… what? An angry hippie? [20:50] <+DGMiller> The kids are the real threat, so the monsters have to focus on the enemy that they know can see them. But of course they’re just kids, so the monsters maybe underestimate them at first. [20:50] <+DGMiller> Could be an angry hippie, yet. [20:50] <+FabledEnvironments> Perhaps or maybe a bear or large dog/wolf. They would struggle to make sense of it. [20:51] <+DGMiller> Or usually, he won’t see anything until it’s too late. Remember, monsters go after teenagers parked at Lovers Lane, or adults that are preoccupied with other concerns, as they often are in the 80s films. [20:52] <+DGMiller> And the authorities put it down to wild animal attacks, an escapee from an asylum, an “other” like a drifter (crazed hippie) from another town, etc. [20:53] <+DGMiller> The marks on that corpse we fished out from under the pier must have been caused by fish after the kid drowned, right? [20:55] <~Dan> How do you handle kids’ access to weapons? [20:55] <~Dan> And for that matter, how effective are weapons against the typical monster? [20:56] <+DGMiller> My note to the GM is to limit kids’ access to firearms. I also recommend they give a penalty to accurately firing them due to the small stature of the kids, etc. And just to stay in tune with the genre. [20:57] <+DGMiller> If a gun gets pulled out, it should be for a climactic confrontation. That’s the only time you really see guns in the classic films. Think about having to explain things to mom & dad and the authorities if you used them more often. [20:58] <+DGMiller> Remember, the adults can’t see or comprehend the monsters. If the kids were running around with guns, they are going to get into a lot of trouble, and probably end up in an asylum. [20:58] <+FabledEnvironments> I could see a lot of improvised weapons. [20:59] <+DGMiller> Like wooden stakes, silver slingshot bullets, etc. [20:59] <+DGMiller> Super Soakers full of holy water. [21:00] <~Dan> Are the kids meant to go head-to-head with the monsters? [21:00] <+DGMiller> Think of the kids in The Lost Boys, the Frog Brothers. They were well prepared. They didn’t have guns, but they were well prepared. [21:02] <+DGMiller> They will need to be like the Monster Squad or the Frog Brothers or even Charley Brewster. [21:02] <+DGMiller> But first they have to learn how to do it effectively. [21:02] <~Dan> How do they live long enough to do that? [21:03] <+DGMiller> Kids are sneaky and resourceful. And these kids, as I said, are capable. [21:03] <+DGMiller> All kids are really good at running away and finding a place to hide, then planning a way to fight back. [21:04] <+DGMiller> Remember, Wolf Man’s got nards. [21:05] <+FabledEnvironments> Reading the early draft of the preview document, I thought more Home Alone than Red Dawn. [21:06] <+DGMiller> Yes. Booty Traps, as Data was fond of saying. [21:06] <+DGMiller> And staying one step ahead of the monsters. [21:07] <+DGMiller> Before eventually taking the fight back to the monsters and hopefully saving the town. [21:08] <~Dan> Hmm… I’m about tapped out on questions. Is there anything we haven’t covered that you’d like to bring up? [21:09] <+DGMiller> Well, I would like to thank you for inviting us to chat tonight. I would also like to thank Tommy and Charles for being here and helping to answer questions. [21:10] <+TommyBrownell> We haven’t actually mentioned the Kickstarter yet, have we? [21:10] <+FabledEnvironments> I’d like to say that Darren is Kickstarting this book Oct 17th. [21:10] <+DGMiller> I think that was the official first unveiling of the date for the Kickstarter. [21:10] <+DGMiller> Yes. We will be Kickstarting on October 17th. [21:11] <+DGMiller> It will run for 30 days. [21:11] <+DGMiller> There are some neat things cooked up for the campaign. [21:11] <+DGMiller> Including some pregens and an adventure for Halloween by Tommy Brownell himself. [21:11] <+TommyBrownell> In addition to the free preview document linked above, we are aiming to have a one sheet adventure with pregens out in time for Halloween games.